The "Bearing capacity" frame displays the results from the analysis of foundation soil bearing capacity. The stress in the footing bottom (assumed constant) is derived from all verifications performed in the frame "Verification". The programs "Spread footing", "Spread footing CPT", "Pile" and "Pile group" then considers all verifications as load cases. In the program "Pile CPT", just normal load is used. Pressing the "Run program Spread footing" button opens the program "Spread footing" which allows to calculate the soil bearing capacity or settlement and rotation of the footing. 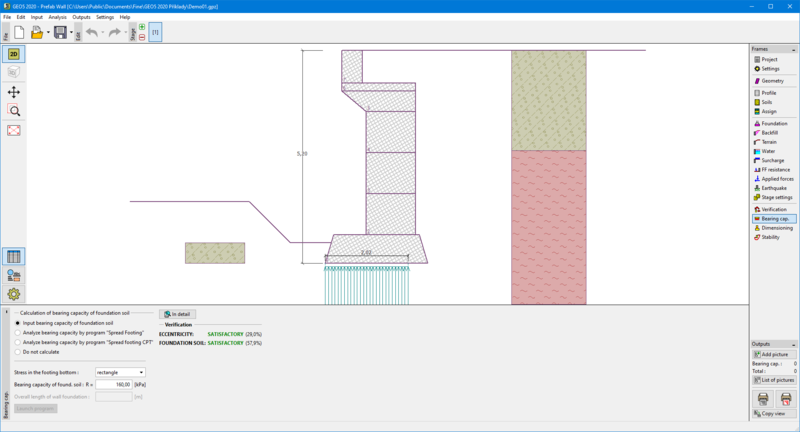 Pressing the "OK" button leaves the analysis mode - the results and all plots are transferred into the program "Prefab wall". The "Spread footing" program must be installed for the button to be active. Overall length of wall foundation is input. Analyse bearing capacity by program "Pile"
The procedure is identical as if calculating soil bearing capacity by the "Spread footing" program. The "Run program Pile" is available if the wall has pile foundation (frame "Foundation"). Pile spacing s is input. Analyse bearing capacity by program "Pile CPT"
The procedure is identical as if calculating soil bearing capacity by the "Pile" program. Analyse bearing capacity by program "Pile group"
The procedure is identical as if calculating soil bearing capacity by the "Spread footing" program. The "Run program Pile group" is available if the wall has pile foundation with more then one pile (frame "Foundation"). Pile spacing s, overall number of pile rows n and loading length l are input.